Is the Fujifilm XP70 good for Portrait Photography? 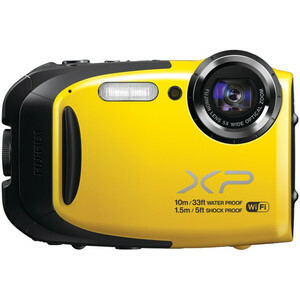 Fujifilm XP70 has a score of 34 for Portrait Photography which makes it a POOR candidate for this type of photography. If Portrait Photography is important for you, we strongly recommend you to consider the Alternative cameras listed at the bottom of this page. Fujifilm XP70's 16.0MP resolution is not the best in its class but you can still manage relatively large prints of your portrait shots and crop without losing too much detail. It is difficult to achieve that shallow depth of field and blurry background for your portrait shots with a small sensor. RAW files contains more color information compared to JPEGs, so it is easier to get a natural skin tone and colours during post processing, which is very important for portraits. Use of External flash creates many creative lighting opportunities for portrait photography and built-in flashes are almost useless for portrait shots. In the lack of a a viewfinder, holding the camera away from the body while using live view is not very stable, especial with heavy camera bodies and lenses. Besides, LCD screens are very hard to read under bright sunlight. You have to nail the focus perfectly for a good portrait shot. Compact cameras are not great at focusing at low light and complex lighting conditions, so manual focus mode is very useful at these times. A correct exposure of portrait model is crucial. Even though modern digital cameras features advanced algorithms to calculate the right exposure, they still may fail some difficult conditions. Lack of manual exposure mode in these conditions means lot of shadow and highlight clipping. Good handling and existence of well placed physical controls on the camera body is very important during portrait shooting. It is faster and more intuitive to change the camera settings with dedicated buttons and knobs instead delving into the menus on the LCD.